Play FM18 with updated squads as if it's FM19. This Transfer Preferences Update affects all playable leagues and beyond, in an effort to make transfers more realistic in FM 2018. I did some intensive work to improve transfer preferences of all playable nations and many other inactive ones. Applying this update should make transfers more realistic. 1) Download the .fmf file. 2) Drag the file into your "Editor Data" folder. located at \Documents\Sports Interactive\Football Manager 2018\editor data. If this folder doesn't exist, create it. 3) Open Football Manager 2018 and start a new career, In the top right of the screen, under "Database", make sure "CarlosVFerdinand_TranfPrefUpdate" is selected. 16 comments have been posted so far. I believe FMTU is the future of transfer updates. Anyone (with a free member account) can submit missing changes using a user friendly transfer wizard that's much easier to use than the pre-game editor. Then a team of admins approves the submitted changes. There are hundreds of changes added daily, while the downloadable update is repacked every morning. Check it out at fmtransferupdate.com. and it's dead or what ? no support from the maker ? like in coments ? LLovely, did you use any other files along with this one? or did you ONLY use this one? I played with this and my game crashes after a season. Can´t play any games .. Has anyone the same problem ? Please describe all facts about this file in detail. We need a manageable overview of this file. Which countries, which leagues etc. What exactly does your file do? List everything on the file description. I'm interested but you need to be more specific and say what you changed to improve the AI. @CarlosVazFerreira it works from the 1st transfer window? 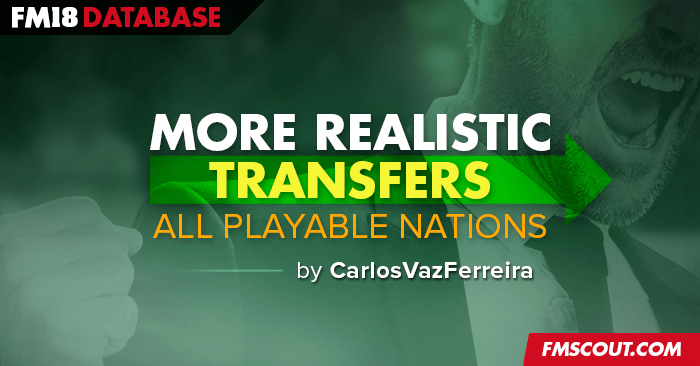 @PlayStrox01 This update improve entire transfer market and its activity in there is more transferences between the different countries. Sooo, Russian transfer window will be more active? Hello, Can you Explain exactly what this Data change? needs a new save ? Hi this is very interesting, can u provide a little more info or some examples of the different AI behavior? Handcrafted in Symi, Hellas. Page created in 0.438 seconds.